In what likely is the most egregious example of prosecutorial malfeasance in recent history, Mike Nifong, the Durham County, NC district attorney who falsely accused and persecuted three Duke University lacrosse players, is finally beginning to get what he deserves. Few cases of bad conduct are worse than a judicial officer deliberately pursuing innocent people, charging them with crimes, and trying them on those charges for no better reason than political ambition. That is what Nifong did. The lives of these three young men and their families were turned upside down for more than a year, they spent tens of thousands of dollars each trying to fend off the forces of the American judicial system, which was manipulated against them by a miscreant prosecutor seeking reelection. Duke University, which has its own shameful behavior to account for in this incident, also suffered from Nifong’s selfish crusade. 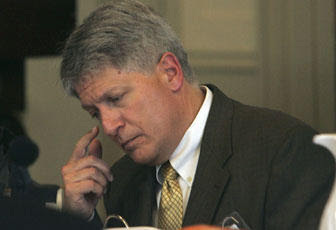 F. Lane Williamson, the chairman of the three-member disciplinary committee considering ethics charges against Nifong, commented, "This matter has been a fiasco. There's no doubt about it," just before it stripped the Nifong of his state law license. Williamson’s comment is classic understatement; it is impossible for me to find words to suitably describe what Nifong did. Disbarment is an essential penalty for Nifong, but it should be only the first one. He should be made to repay all expenses incurred for defense of the three players and to repay North Carolina for the cost of their trials, even if that means that his every possession is seized and sold off. And if Nifong doesn’t have enough to cover the attorney fees, the State of North Carolina should pay the rest, and force Nifong to work for the State for free until he pays the rest. But not until he sits in a jail cell for a few years to pay his debt to society and to consider his disgusting behavior. We Americans put our trust in the mechanisms of our government, and the people who perform duties for us through their government service. Breaching that trust, as Nifong did, is an intolerable injustice, an unforgivable failure of government to serve its citizens, and must be resolved with the most strenuous sanctions and penalties. Mike Nifong must become a symbol of what happens to government servants and elected officials when they break their trust with the American people they serve.